From: Russian River Brewing Company in Santa Rosa, Calif. Poured a reddish dark brown color with one finger of khaki white head when I got it. Below average foggy lacing on the sides. Minimal-to-bad retention on the top. Smelled dark cherry, black cherry, sour cherry. So cherry. Also raspberry, red wine (Cabernet? ), purple grape and plum. Tasted similar to the nose, but better. Got sour cherry, black cherry, Cabernet red wine, sour grape, plum and raspberry. Very smooth. Medium body. Oily texture. Soft carbonation. Long, smooth finish. This beer just got better each drink. Fantastic. The most deceptive 10% ABV beer I've enjoyed to-date. I've had beers that mask higher ABV with massive flavors, i.e. super hopping, bourbon barrel aging, tons of malt, massive fruit additions, etc. but this beer does so with seeming simplicity and grace. Purplish reddish hue with a puffy, soapy head that dimpled, sagged and then faded away. Aroma and taste is a balanced dance between jammy fruit, oak, funk and tart. There's sweet and slightly puckering fruit that feels like a mélange of berries - blackberry, raspberry - followed by plump red wine grapes and then red wine itself. Tannic and dry, somehow still light on the palate - this is an awesome example of the style in which the ABV only helps accentuate that sit-back-and-sigh feeling after every sip. Just outstanding. Bottle dated 11-4-14 poured into HF stem glasses. Smell is red wine dominated, with oak and a hint of sourness making an appearance. Taste is incredible, like a sour, carbonated red wine. I received both this and Supplication together in a trade, and I actually preferred this. My "desert island" sour. Serving: 375 mL bottle ("bottled on: 040416") poured into a 9 oz Libbey Embassy snifter. Appearance: Hazy, tawny reddish brown with a sparse head of off white foam; spotty lacing. Smell: Plenty of lactobacillus - tart vinegar and some funky barnyard; and some nice dark fruit. Taste: Layers of flavor. Tart wine vinegar leads the charge with notes of currant and dark fruit, roasted malts, charred oak and fleeting savory, umami notes. Mouthfeel: Light to medium body with smooth but lively carbonation. Overall: Nice mix of darker malts and lighter tart notes; complex but balanced. A gorgeous reddish brown beer with a quickly fading head. No lacing but a constant patch of bubbles float on the surface above the nucleation site. 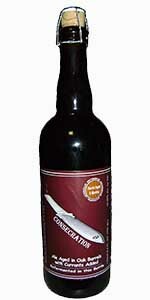 The aroma is a medley of oak, red wine, vanilla, tart cherries and a hint of chocolate. The taste is woody, sweet, and vinous. There are also cherries, vanilla and chocolate in the taste. This is just outstanding. This is meant to be a valid criticism of this beer. This is a back to back tasting of Consecration and Supplication. I openly challenge anyone and everyone to do a blind tasting of these beers. They are interesting in their own way, but all I see them as is a vessel to deliver the bitter strain of yeast that they have in common. This beer is nothing more than sour, you cannot taste the currants or anything. RR Cornered the DIPA.TIPA market with the Pliny's and is in search of a new thing, unfortunately it does not deliver. These beers are nothing more than sour. Bottled 03/13/15, 12.7 oz bottle. Big gun smoke from the cork. Pours with a highly fizzy, slightly tan head that starts high but dissipates quickly. The carbonation is very evident still after 2 years. Pour starts out a copper and turns to a deep amber. Bubbles all over the bottom of the glass and intermittently rises up. The smell is of what I assume to be currants as it has quite a fruity bouquet. Definitely getting the Cab wine aroma in here, with a small amount of wood on the back end. No alcohol aroma at 10%. Nose is great. The taste compliments the nose in many ways. This beer is basically a cab, but the fruit takes over and it's not dry. The initial flavor is like a wine, but seamlessly blends in the fruity currant flavor, and then some tangy acidity on the back end. The sourness is very subtle. Not really much wood that I pick up except maybe in the aftertaste. Alcohol not present except for a little warming sensation going down. There is a mild tobacco flavor as the beer warms but in no way is this off putting. The mouth is full bodied with a mid level carbonation despite the highly carbed appearance. I don't know how but this is a refreshing, thirst quenching 10% sour. I've been wanting to try this beer for a long time. It did not disappoint. This is easily the most balanced sour I've ever had. What is crazy is how refreshing and thirst quenching this is, for a sour at 10%. I would love to have a crack at this fresh. However, I paid $19 for this 12.7 oz beauty. I will certainly pay attention to events and alerts of local establishments when this comes on tap, it's hard to justify spending the $ for a bottle, but it is so good. If you see this and have the extra $ laying around I HIGHLY recommend. One of the top rated sours in the country and I finally got one from my buddy Randy! A - Rich burgundy color when poured but is a red-tinged brown color in the glass. Slightly cloudy from the yeast with a nice white head but subsides to nothing after a minute or two. S - The smell is fruity and very complex. It is vinous with the currants and typical cab grape fruit notes. There is some alcohol, some fruit esters, and some soft Belgian character present. There is some sour and some oakiness but the dark fruit character is true. T - The first sip just explodes with red wine vinegar! The sour makes you pucker from the front to the back of the palate. After the initial sour punch the complexities come out. There is a fruit character more like Cabernet and not as much like the currants. There is the sweetness of the malt, oak, and some Belgian character but it is very subtle in comparison to the strong sour character. M - Medium to light mouth-feel with light carbonation. Like a sour soda that has fizz initially but dies down and for 10% ABV it is much more like a wine than a Belgian strong ale. Overall, a very interesting beer. I was not expecting the full on sour, red wine vinegar, shock to my palate when I first cracked this open. It is a unique experience with a distinct sour and then sweet/complex nature. It is also very thin for what the base beer is and very much like a sour wine. I would not recommend this unless you like sours and have a heart for a bolder sour experience. I could see someone liking it but at an "rAvg: 4.5" I was expecting more flavor and less sour. Popped and poured a 2014 bottle, poured dark reddish brown with minimal head and lacing. Very much wood forward, nice fruity nose and the taste followed suit, with a little pucker factor and vinegar. The fruits were minimal, but it was an older bottle. Damn good beer. Looking forward to trying a fresher bottle. The smell is just as I remember from the samples I had at last year's GABF...Cabernet Sauvignon notes dominate with big notes of vanilla and oak and fruit that *is* currants. I love red currants on buttered toast and the smell here totally reminds me of that. The taste is deliciously both sweet and tart up front. Maybe a bit more intense than I remember from the 1 oz samples but hey, I love that it is and I love the fact that I now have 25.4 oz, give or take a few as I've just taken a few sips, to take my time with and savour. The foam is now gone but I can still see the lively carbonation throwing up....errr...tossing...err..the bubbles are still making their way to the top nearly smack damn in the center of the glass. Back to the taste. I'm now getting a pretty big kick from the Brett(sorry, I have a hard time spelling it out) and I'd be amiss if I didn't say there's a fair amount of caramel malt here, hence my first sentance on taste. Gee wiz this is so damn tasty and there's so much going on with the flavours, I can't describe them all properly. Medium mouthfeel and pretty high carbonation, a plus in my book, it finishes with big sour and Brett notes. Wonderful! Bottom line: A superb! American Wild Ale that I fell in love with from my very first sip. A must try for anyone who favours the style! Finally..a big Thank You goes out to The Wine Underground in Englewood CO for making this available online! Pours out a dark reddish clear brown with one finger of white suds and lots of lacing. Smell is just the best. Sour grape and cherry and dewberry and a slight lemon zest. Something in the back like a sweet soad pop. Grape? Bubbley wine and vinegar sugar in a complex malt. 10%er. Burst of lemon and dry candy sour green apple candy and a very strong raspberry/grape sourness. The cab and the wood really come through. Mouthfeel is just perfect. Clean enough and dirty at the last. The aftertaste lasts and lasts. Drinkablilty is great here. I love this. Perfect. A: Brown pour, ruby highlights, thin, off-white to tan head faded pretty quick but left decent lace. S: Funky, sour, lactic tang, dark fruit, black currant, cask wood. A huge nose with the promise of great things to taste. T: Incredibly sour, tangy, oaky. Black currant, dark, bready malt, barnyard, brett bitterness, lacto tanginess, vinous, tobacco leaves. M: Highly carbonated, satisfying. The carbonation balances the intense sourness well. D: Incredible. Amazing. Easily rivals anything brewed in Belgium. Brewing brilliance at its finest. I wish it were more widely available. Pours a very dark brown that shows some red when held to light. Head is on the low side of medium and dies pretty quickly. Aromas are tart and woody with sour cherries, big dry Cabernet, and some light funk. More cherries and other fruit on the palate, some vinegar-esque pedio acidity, red wine dryness, and high amounts of lacto sour. As it warms I'm getting some powdery unsweetened chocolate, bittersweet blackberry, and more woody tannins. The amazing complexity of this one makes it tough to pick up on the 10% ABV and keeps this very drinkable. The medium natural carbonation is well complimented by the long draw of dry/sour to keep the mouthfeel interesting. Overall my favorite wild ale to date. Truly world class. Vinnie & co have hit another one out the park. Don't miss this one. A- Deep mahogany color. Minimal head dissipates rapidly leaving a thin ring of tan bubbles hugging the outside of the glass. S- Aroma of sweet dark berries and brett. Smells acidic and funky. T- Starts out tart and sour with a nice flavor from the currants coming in mid palate. Notes of berry and oak from the cab barrels are present in abundance. Barnyard funk is present throughout, and the finish is semi dry with a lingering tartness. M- Feel is medium with a nice prickly level of carbonation which works well with the tartness of the beer. O- One of my favorite Russian River brews. The wonderful meritage of sour, tart currants coupled with the complexity of the oak and Cabernet make for a very enjoyable sour experience. Highly recommended! How I love the Eastside..
8 oz into a snifter. This is a medley of the gods. Yes, there are currants here, but there is so much more, and it is hardly about the fruit so much as about the magnificence of of the blend. Sharply sour, there is a slight fruit funk to it but blending in well with the minimal malt presence. The clear amber looks absolutely glorious in the glass, sturdy and lovingly giving its all to you, astute beer drinker. Smells and tastes sharp and slightly fruity, currants. An absolute treasure, a pleasure. It rips its flavor into your throat, forcing you to appreciate or die trying. The alcohol comes out a bit but the sour dominates the profile. This is a magical beast, worthy of all praise.